Is the latest Greek debt deal sustainable or another kick of the can? 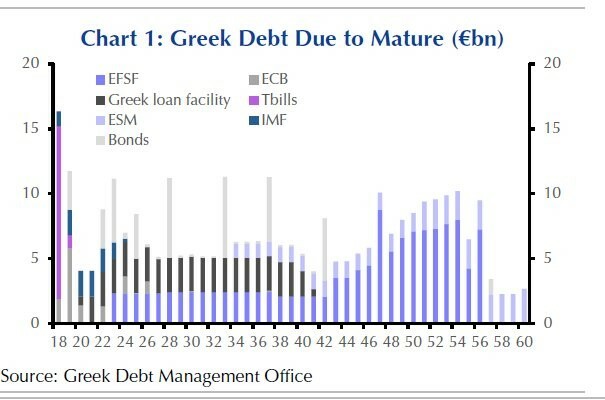 The Eurogroup recently granted Greece relief through an extension of loans that were part of the second program of the European Financial Stability Facility and extended Greece’s most pressing loan maturities by 10 years (see Figure 1). 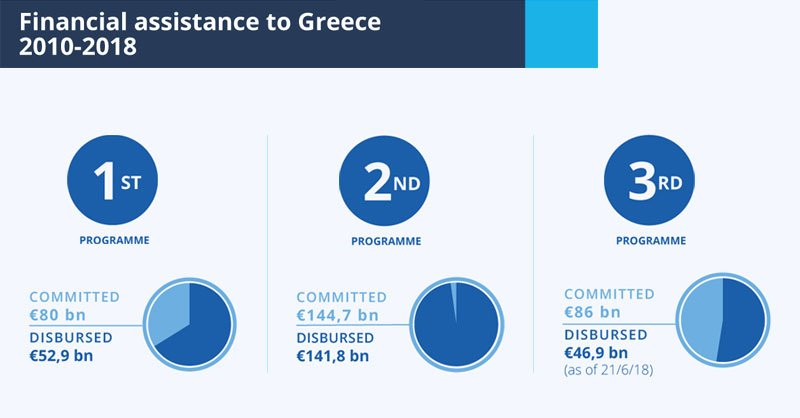 The country was also given a 15 billion euro tranche from the 86 billion euro third program to be used as a “cash buffer” once the third Greek aid program is successfully concluded. This is intended to calm markets so Greece can borrow at much lower rates. The International Monetary Fund will not participate in the program with a new loan, but undertake enhanced surveillance until 2022 to ensure continuity in the reform process. In this context, the Eurogroup published an extended annex including 13 technical documents that detailed obligations akin to conditionalities. Those believing that this is not a new, fourth program for 2018-2022 should read the documents. Greece will also get 4.5 billion euros from European Central Bank profits on Greek loans as part of the Agreement on Net Financial Assets and the Securities Market Program. Installments will come in equal, biannual amounts starting in 2018 until 2022. Finally, a decision was made to abolish the stepped-up interest rate margin related to the debt buy-back tranche of the second Greek program as of 2018. Note: The EFSF loans in deep blue colors are extended for 10 more years. Both creditors and the Syriza government optimistically declared Greece is now expected to stand on its feet as the cash buffer of 15 billion euros plus another 9 billion euros already built up previously are expected to ensure the return of Greece to the debt markets. Adding a dramatic flourish, Greek Prime Minister Alexis Tsipras even donned a necktie to celebrate the end of austerity. Any debt lightening is welcome for such an overburdened country, but the critical question is whether this debt arrangement is sufficient to help Greece return to the markets at a sustainable rate. While the cash buffer of 24 billion euros can cover Greece’s payback obligations for the next couple of years, it would be far better to keep that buffer intact as a guarantee for the market. However, interest rates on the 10-year bonds still remain above or around the sky-high price of 4 percent, signaling that markets are, at least for the time being, not fully convinced that the country can service its debt in the medium-term. Compounding that, the forecast for real GDP in the long term is expected to average only 1 percent. This is the reason that 5.5 billion euros out of 15 billion will be used directly for repaying the IMF (3.3 billion euros) and the European Central Banks (2.2 billion euros). Another persistent and major concern is that Greece is obliged to maintain a primary surplus of 3.5 percent of GDP until 2022, followed by a 2.2 percent primary surplus target for the ensuing period until 2060. 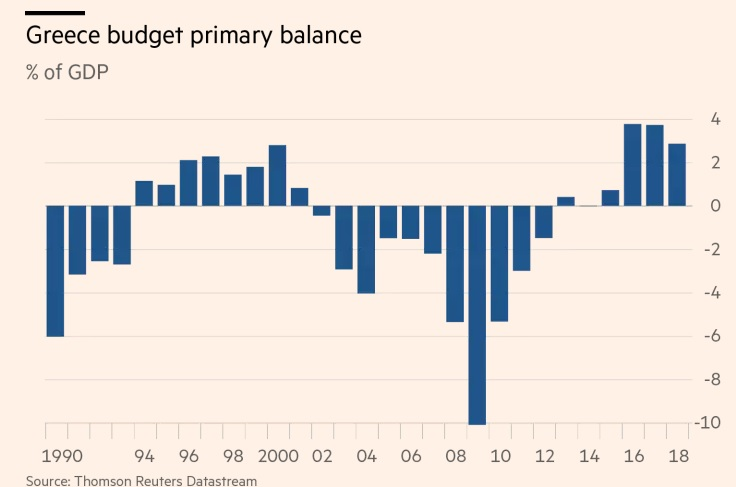 This is definitely amounts to a pro-cyclical, contractionary fiscal policy, given Greece’s perpetual struggle to attain sustainable economic growth in the medium term. Last but not least, as can be seen in Figure 3, in the context of the third bailout program, only 46.9 billion euros have been disbursed up to now. With the final tranche of 15 billion euros, one can easily see that Greece has used only 62 billion euros out of 84 billion. This is critical, as the terms for the money were very cheap (a 0.9 percent interest rate), and by using it entirely, Greece could have either bought back some more expensive loans maturing soon or they even could have used it to invest in the real economy. Another important caveat is that the European Stability Mechanism will have the right at any time to redefine how the 15 billion euros may be used. In other words, the tranche may remain in the pocket account after assessing whether such funds are needed as a cushion. Indeed, the use of the 15 billion euro buffer will be possible only after ensuring that Greece’s financial needs are covered by the country’s own public coffers! Really, if one compares the current markets’ 4 percent interest rates (in the case of 10-year bonds) with the terms of European Stability Mechanism’s bailout money (0.9 percent), one can easily understand why the Eurogroup’s latest decision may not have justified the donning of a necktie.